There’s never anything fair about bad people hurting good people. It’s not a particularly fun lesson, but it’s all Mack can convey to Flint, the newly awakened Inhuman still struggling to decide what it means to have powers in a place where violence is the only real communication those in charge will exchange with the remnants of humanity. “I’ve lost people too...and it doesn’t ever get easier,” the agent informs his young charge, reaffirming the unfairness of it all, and trying in some small way to provide a moment of respite from the surprising murder of Tess. It doesn’t last—those moments never do, especially not when the younger recipient decides to take that knowledge and fight back, using his power to shove a rock blade through the eye socket of his Kree captor. Caveat emptor, Kree makers of Inhumans: Buyer beware. "Together Or Not At All"
Our heroes are on the run throughout the entirety of “Together Or Not At All,” which is where the show often delivers some of its more consistently satisfying storytelling, the action continuous and the dialogue sharp and funny. Nearly everyone delivers at least one solid bon mot during this hour, and that humor is what helps keep things lively during stretches when it occasionally felt like scenes were slightly padded to fit the running time. The script by Matt Owens maintained insightful and humorous character beats, and combined with the nonstop movement and cat-and-mouse games of the Kree warriors tracking our team, it elevated what could have easily become a perfunctory exercise in moving around pieces on the narrative chessboard, getting S.H.I.E.L.D. to the earth’s surface and further exploring the backstory of our villains. Indeed, the go-go adrenaline coursing through the sequences with the good guys meant nearly all the character development took place with Kasius and Sinara, as he dealt with the overbearing presence of his supercilious brother Faulnak and she with the alpha-dog posturing of Kaulnak’s warrior, Manston-Dar. (What an unwieldy name; no wonder it’s only uttered aloud once or twice.) But as useful as it was to further clarify the familial drama that spurred Kasius’ Napoleon complex (his father sent him on a suicide mission, only to brand his son a coward when Kasius managed to escape with his life), the richest drama comes from the surprising well of pathos that exists between Kasius and Sinara. Her commitment to a man she clearly identifies as physically in need of her support (“The battlefield is not my place,” he freely admits, just before putting a blade through his brother’s chest) complicates their dynamic, making it something more than just the standard blustering-egoist-and-silent-servant relationship. He’s just as much in her thrall as she is in his, and that codependence helps to explain their us-against-the-world mentality, wholly directed toward freedom from—and retribution for—their past. For as much of a disappointment as it is when our team gets separated for long stretches of time, the show knows how much fun it can be to bring everyone back together. First, it’s the reunion of Daisy, Fitz, and Simmons, with the latter two immediately finding comfort in one another’s arms, only to spend the first half of the episode fleeing Manston-Dar, with Fitz even taking a bullet to the side. Then, it’s joining that trio up with the rest of the S.H.I.E.L.D. crew, the stressed but relieved hug shared by Coulson and Daisy providing the only evidence of affection needed among them all. 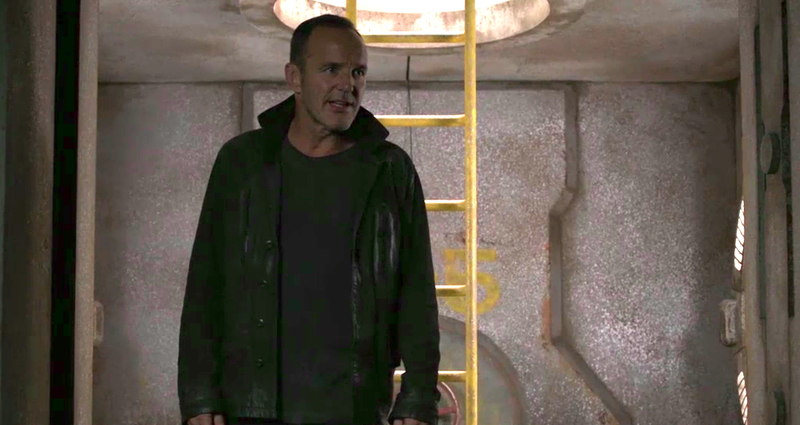 (Though Mack does a decent job adding to it when Simmons tells him the story of Fitz’s journey into the future can wait: “Not when those stories include time travel!”) The many little asides and snippets of information bringing each other up to date are precisely the sort of keep-it-moving dialogue that should characterize a frantic escape attempt, and demonstrate the familial bond among everyone. Not that Mack and Yo-Yo don’t immediately bail on everyone when Flint decides he has to stay and fight the Kree. For an episode titled “Together Or Not At All,” this was a bit of an ironic twist, getting the team together only to instantly fracture them again. We already had the tension of May being stranded on the surface—with Enoch, the two of them having been pulled from the gravity storm by the now-wizened Robin, a.k.a. the little girl who created the prophecies in “Rewind”—and Mack and Yo-Yo are going to split off yet again? I understand the impetus, but it also seems a bit rash, especially after the warnings to Flint to not go running off half-cocked. Sure, Fitz stashed a cache of weapons on the floor with all the alien creatures (“How was I supposed to...? !” he sputters), but this doesn’t seem like a very good plan. Interestingly, this story seems to be going beyond the confines of the tripartite structure of last season. Unless everything wraps up next episode—a rank impossibility, as far as I can tell, save for the remaining story getting very short shrift indeed—the “Ragtag” outer-space arc is going to comprise the entire first half of the season. What makes it work without feeling overly drawn-out or unnecessarily complicated is how these episodes have all been of a piece, continually pushing forward with a breathless pace even as nothing much necessarily happens in any one installment. Fitz’s episode, the one that would have made most sense to slow down, was just as frenetic and energized as any of the tension-filled outings set on the Lighthouse. They haven’t all been equally successful, but none of them have yet felt extraneous, not even now that we’re focused on Flint, he of the suddenly-we-care story arc and connection to the human population in the enslaved colony. Deke’s reintroduction provides the other bookend to the human characters that would otherwise be interchangeable cannon fodder. Assuming we meet his father on the earth’s surface, it will lend a meaningful face to the resistance against Kasius’ rule and help supply much-needed attachments to the people aiding Robin (who herself provides a useful link to our team). There were a few good action beats, but overall this was a run-and-gun scenario, with Daisy and the others only trading enough blows with their hunters to allow enough time to make it to the next stop on their escape route. 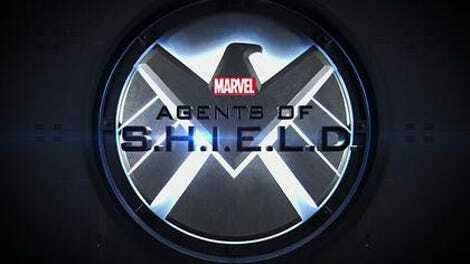 This isn’t Agents Of S.H.I.E.L.D. at its deepest or most emotional, but there are few shows that know how to have as much fun without sacrificing logic or coherence. I can’t be the only one initially baffled to see Kasius alive at the start of this episode. “Didn’t Jemma cut his damn throat?” I wondered, and it was only after re-watching the “Previously on...” montage several times that I realized she had merely sliced his cheek. My brain had thoroughly convinced me I had witnessed a throat-slashing—and frankly, Simmons probably should’ve managed to do just that. Turns out the Lighthouse maintains gravity through the manipulation of Gravitonium, which longtime viewers will know hasn’t been seen or mentioned since way back in season one. Suffice to say, it’s not the most stable element in the universe, and was last seen in the hands of amoral billionaire Ian Quinn. So Jemma’s implant can be removed from one ear canal with pliers, but Daisy’s is stuck on her? Sure, why not.